Growing up in the gritty streets of St. Louis, Terrance Frazier has either been through or seen practically everything that the street life has to offer. The only thing the game gave him was a lot of heartache, pain, misery, and a ten-year federal prison sentence. It was there he discovered his talent and love for reading and writing urban novels. His goal is to entertain and educate in hopes that the world will get to know Frazier Boy, the author, on a more intimate level, and hopefully fall in love with his art of storytelling. "I’m not saying that I’m here to change the game, but to add to it and establish a solid fan base..."
THE HUSTLE: Fresh off of a ten-year bid, Sean Martin returns to the streets, where he once grinded his way to the top of the game. Before his incarceration, Sean had it all--a beautiful woman, a handsome newborn son, and all the finer things in life. He was THE MAN. However, all of that changed when he went to prison. He lost everything! New and improved, Sean sets out to achieve his goals with a new hustle, but he needs start-up money. On his first night out of prison an unfortunate incident seems to be a blessing from above. With an easy to understand writing style, cartoons and graphs, and poetry (yes—poetry), John Trestrail takes the reader through the types of poisons, how a crime scene(s) should be handled and what to look for in an autopsy. One of the best chapters for planning any crime story (mystery) is Chapter 10. He breaks down the method of investigation by using victimology as the starting point, just as the Special Agents with the FBI Behavioral Analysis Unit (commonly incorrectly named by “Hollywood” as profilers). Before I discuss the chapters in this book, let me quickly outline the method that Trestrial uses in Chapter 10. (also see my previous posts on the Writers’ Lens: The Murder’s Ladder (http://www.thewriterslens.com/2012/01/murderers-ladder.html ) and The Fluid or Unstatic Theory of Plots (http://www.thewriterslens.com/2011/11/erle-stanley-gardners-fluid-or-unstatic.html). Sadly, for me, Trestrial does this in a more visual and effective method. C. Was the victim random or targeted? A. Since this is a book on poisoning: Was the poison solid, liquid, or gas? B. How was the poison absorbed? A. With a poisoning (as with a shooting and a few other methods of homicide), there may be multiple crime scenes. 5. The scene where the victim dies. A. Poisons take time to work, even the fast acting ones. 2. If slow acting: same as 1, but add hair. A. What did the victim stand in the way of? B. Why did the victim become the victim—Why them, at that moment. A. How was the poison administered? 8. (And this is the scary part, even for me) If the investigators don’t consider poison in the first place, it will never be detected. If any story you write has poison involved (even if it is some kind of made up poison on some distant world), you will want to have this book as a reference. Do you have a reference book you like to use for your crime research? Don’t be shy. Please share the title, author and why in the comments. I will take a look at it and I may include it in a future From a Crime Writer’s Library post. My husband and I are big library fans. We're at the local branch a couple of times a week, and between visits, we download ebooks and audiobooks. We got our grandkids cards so we could take them to our county library when they visit, and they look forward to going, too. We contribute as "Friends of the Library." Our lives would be far less interesting and informed without the library system. Because of that, marketing to libraries was high on my "to do" list before my debut novel was published in October 2011. Some people may wonder why I'd rather have my book in libraries than on the shelves at Barnes & Noble, but it's all about readers. As a May 2009 "Library Journal" article stated, "Libraries are far more than a market…Libraries create readers." In hard economic times, they also provide a way to keep those readers reading. According to the latest federal nationwide public library survey, published in October 2011, visits nationwide to public libraries totaled 1.59 billion, or 5.4 library visits per capita. There were 2.41 billion circulations of library materials (8.1 per capita). Of course, many library readers are also book buyers, and libraries buy a lot of books. The study reported libraries spent $1.3 billion, and library sales accounted for about 40 percent of the children's book market and more than 10 percent of the $27 billion book industry. Getting reviewed in Publishers Weekly, the trade magazine for the industry, or in Booklist, Library Journal, and Kirkus Reviews are critical, but almost impossible without advance reading copies (ARCs). If your books are print-on-demand, as most small press and self-published books are, it's unlikely you'll get pre-publication reviews. Even post-publication, it's difficult to get reviewed, despite wonderful reader-review programs at Goodreads and Library Thing. Although I continue to diligently seek post-publication book reviews, I was finally able to get an ebook copy of my book in the local library by using the third option above: patron recommendations. Which brings me to the part of the post I warned you about: a call to action. Ripley Patton, a fellow Broad Universe member, initiated the Library Request Exchange idea. I had considered it, but previously reached out only to my family and critique partners. What is intended is a grassroots effort for writers like you and me, which will benefit readers everywhere who would want to read our books if they knew about them. Another BU author, Kristi Petersen Schoonover, suggested gathering everyone's information together rather than doing individual email exchanges. To simplify things even further, I thought we could use the comment section of a Library Request Exchange page to enter our information. Authors can join the exchange at any time through the Library Request Exchange link at the top of this website's right sidebar under "Pages." Once your library advises you they've accepted your purchase request, it would be good to advise the author so he/she can publicize its availability. Active interest will encourage the library to make future purchases of that author's work. I'll get things started with my book information, and look forward to seeing yours. Let the Library Request Exchange begin! Welcome to Pamela Foster, a bona fide member of The Sisterhood of the Traveling Pen. But you'll find out more about that later. 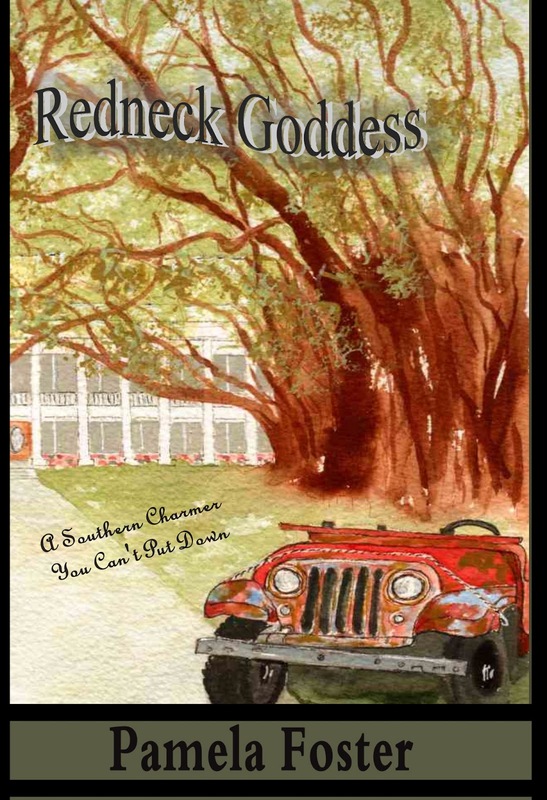 Pamela’s first novel, Redneck Goddess, was set in south Georgia. Bigfoot Blues takes place in the Pacific Northwest. Regardless of the setting, and wrapped around the humor and the suspense and the struggles of her characters, Foster always leaves the reader with a renewed joy in the small moments in life. Her novels are a celebration of ordinary people doing their best and, in the process, often becoming heroes. What inspired your latest book, Bigfoot Blues? As a child, I spent summers with my grandparents in Peckwan, an isolated, rural community known for its Bigfoot encounters. People talked about Bigfoot. They saw Bigfoot. Found footprints. Ran from him in the woods. There was fascination and fear and love for Bigfoot. I swam in Bluff Creek and rode baby pigs down the poison oak slopes of Blue Mountain with children who accepted Bigfoot’s existence as a natural part of the world around them. And I did the same. So, when I wanted to write a novel about a young woman raised in culture of belief that set the faithful apart from most of the world, a heroine struggling to find her own path without betraying the family that raised her, I choose to create Samantha, whose father is a well-known Bigfoot hunter. I could have made Samantha a Muslim, or even some extreme version of fundamentalist Christianity. But the insular world of beauty and awe that I know about is the world of Bigfoot. Besides, I loved those summers spent in the mountains of Northern California and returning to them again in my imagination, was great fun. I set the book in my home town of Eureka (which clings to the Pacific coast at the edge of the Coastal Range) and then sent Samantha and her crew of misfits and unlikely heroes into the mountains around Peckwan and Weitchipec–Bigfoot Country. The characters, as all good characters do, came alive and moved the book in a slightly different direction than I intended when I wrote the opening chapter. These multi-layered, funny, down-home characters had a glorious romp and brought the story home. 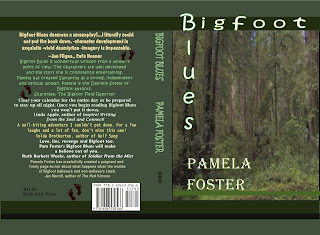 What do you think your readers will like about Bigfoot Blues? The book transports the reader to a foggy, quirky land in the Pacific Northwest. Readers feel the wet, cold beauty of the area and become believers in Bigfoot, even if that faith lasts only until they close the book. Sense of place is strong in all my books and Bigfoot Blues is steeped in the mist and redwoods, bays and lagoons of Humboldt County. The Holy Trinity of writing–Sense of Place, Point of View and Internalization–these are my strongpoints. There is also humor and the reader will laugh out loud as they become Samantha, the Bigfoot hunters daughter. I’ve already written two sequels to Bigfoot Blues, so once the reader has settled into Samantha’s world, they’ll be able to visit frequently. Is there a different genre you’d love to try to write? Both of my published novels, Redneck Goddess, Bigfoot Blues, are contemporary fiction. My agent at Sullivan and Max is hunting a publishing home for two books, Limited Visibility and The Perfect Victim. Both of those novels are contemporary fiction. Even my non-fiction On the Move with Chesty and Rocca is contemporary. Now I’m writing a western, Ridgeline, set right after the Civil War. I write in first person, present tense. I know that’s unusual, but I do it well. The western is written in third person, past tense. Evidently, I love a challenge. What’s your favorite way to interact with fans/readers? I love to teach writing. I do day-long workshops on The Holy Trinity of Writing or, for shorter presentations, break it down and teach only sense of place, or point of view, or internalization. Since the release of Bigfoot Blues I’ve discovered that people are fascinated with Bigfoot and I’ve begun to do talks on The Big Guy. I’m also a part of The Sisterhood of the Traveling Pen–five women authors, traveling together on the winding road to overnight success. This group is a joy and we’re having a terrific time speaking and team-teaching. Whether it’s as a single speaker or with The Sisterhood, teaching and presenting workshops always teaches me something. I learn from those I’m teaching. And, of course, ham that I am, there’s just nothing like being the center of attention at the front of a room and when writers get better at their craft because of something I shared, well, it doesn’t get any better than that for me. We too often fail to see the love and joy that surrounds us. 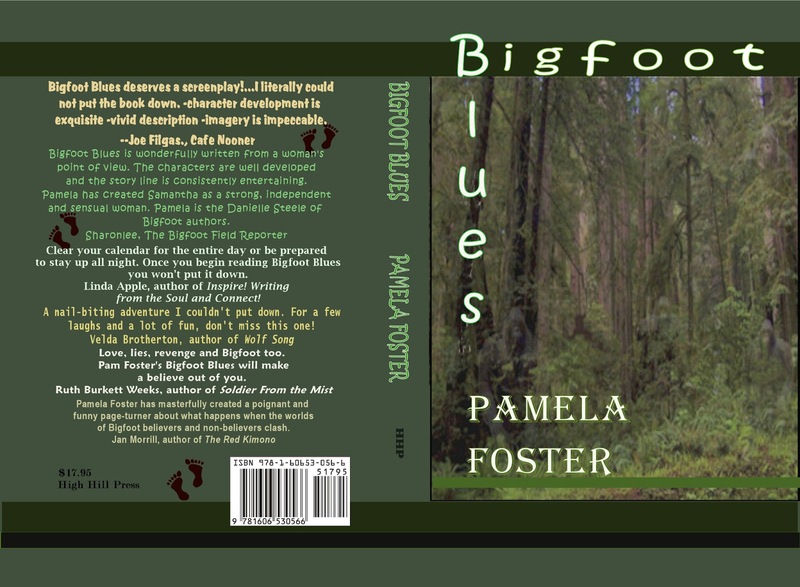 Pamela Foster’s BIGFOOT BLUES explores this truth in a story about one woman’s search to understand the meaning of her life and her place in it. The book takes us on a wild romp through the ancient forests of northern California. We run with an array of shaggy creatures, some of them not even human, led along the way by Samantha Jean, a pistol-packing, redneck woman with a stubborn streak a country mile wide. By the end, you’ll believe in the adventure—and possibly in Sasquatch, too. REDNECK GODDESS: A hilarious romp with a quirky Georgia family determined to stick to its “old south” ways. This is T.W. Fendley. Thanks for reading and commenting on The Writers' Lens.You can find out more about me at www.twfendley.com. The Winner of the Tweeting Giveaway! Congratulations to Jamie Krakover for winning The Writers’ Lens Tweeting Giveaway! To learn more about Jamie follow her on Twitter @Rockets2Writing and read her blog too! You’ll be able to see more tweets about Jaime and everything else The Writers’ Lens is up to by following @writerslens on Twitter. Thanks to everyone for their comments and hash tag suggestions! Keep checking back to see what the lens will focus on next! 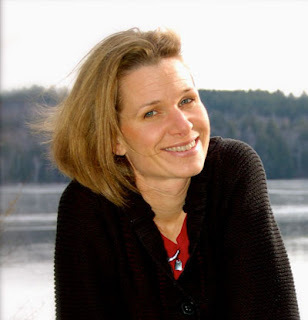 When Ansha Kotyk told me Laura Pauling's latest book was about the Maya, I couldn't wait to learn more. Laura writes for all ages where the real and the incredible combine in heart-stopping adventures. She lives out her desire for travel and excitement in her young adult Circle of Spies Series: A Spy Like Me and Heart of an Assassin. Her middle grade, How To Survive Ancient Spells and Crazy Kings is available now. She’d say that living her life of a suburban mom/author complete with minivan carpools, soccer games, and home-baked snicker doodles are really a cover for her exciting life of secret missions and covert operations, but she’d be lying. She loves living in New England with her husband and children. This may or may not be what she really looks like. She may or may not actually bake cookies. The Writers’ Lens is about "Bringing fiction into focus." What brings your writing into focus-- the characters, the stories, the love of words? That’s a tough question. Most of my fiction is plot driven, so I’d have to say the stories. But the characters and their emotional arc are closely tied to the plot. I love words: reading fun or beautiful writing, but that means nothing to me without a good story. For me, story is king in my writing and in what I choose to read. The big catch there is that so often characters, their stories, and the love of words are all interconnected. What inspired your latest book? 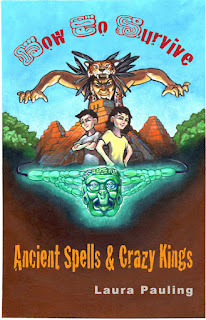 How To Survive Ancient Spells & Crazy Kings is my last book published but not the most recent book I’ve written. I love time travel and high adventure. I love humor with added suspense. Before I started researching the Maya, I felt like I knew nothing about this ancient civilization. Why did they make sacrifices? What were their daily lives like? I embarked on the journey and after reading college textbooks and studying the culture for several years I found answers and wove them into my story. My inspiration was that I wanted to learn. Would you share a bit about your next project? I will be working on Secrets of an Assassin, the third book in my Circle of Spies Series. But I’m currently editing another book in the How To Survive series titled How To Survive Pirate Curses and Tainted Treasure. Bianca and Melvin’s magical adventures continue. How much fact is in your fiction? Given the amount of research I completed on the Maya, I’d say that there is a lot of fact, but I tried very hard to only include those details necessary for the plot. In fact, research helped tremendously in my plot. I studied the lives of the great kings in the golden days of the Maya and what troubles they faced and then planted Bianca right in the middle of that! 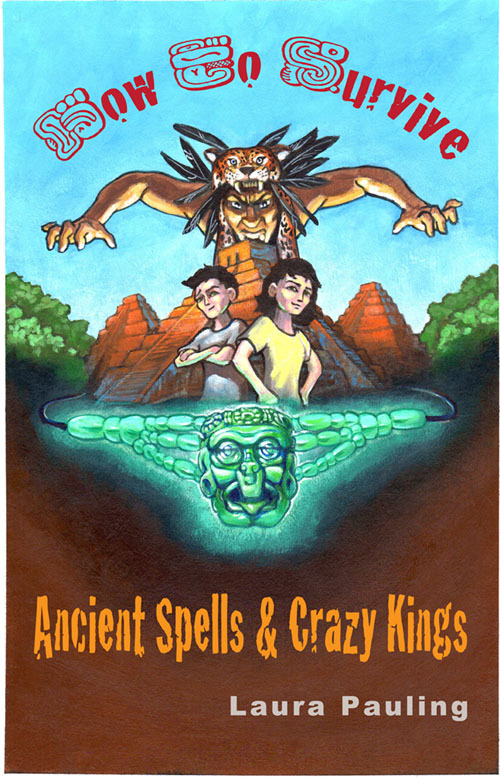 HOW TO SURVIVE ANCIENT SPELLS AND CRAZY KINGS: Convinced that her grandfather, Zeb, needs help, twelve-year-old Bianca persuades her family to fly to the Mayan ruins of Tikal on a search and rescue mission. Impatient, she and her brainy cousin, Melvin, sneak out in the middle of the night and follow the clues to the ancient Maya city of Etza, where the people haven’t aged in 2,000 years. The cousins must learn to work together as they face loin-cloth wearing skeletons from the underworld, a backstabbing princess, and an ancient prophecy—one that says in three days the city will be destroyed. They’ll find Zeb and zip right out of there. No problem. Except, Bianca starts to care for her new friends, and Zeb does not want to be rescued. The fact that a crazy king wants to serve Bianca up to the gods as an appetizer is just a minor technicality. But this ancient evil dude has finally met his match. Carrie lives in Saint Louis with her husband and two children. She has written and illustrated two children's books: The Smile Box: A Story About Feelings and The Swan and the Rose: A Story About Inner Beauty. The Swan and the Rose is about a swan that finds a rose that's already dead. While others see only the way it looks now, the Swan sees the true beauty despite its appearance. Autographed books will be available for purchase on Jan. 19. Today I wanted to focus The Writers’ Lens on something important to all stories, the Point of View. Each has their proper use, and will have significant influence on how your story is told. So it’s best to know your POV before you start, otherwise you’ll end up rewriting an entire book from one POV to another. I don’t suggest that. However, rewriting a short story in multiple POV’s can be a great exercise to discover what POV you are most comfortable with or which is best for your story. First Person Point of View is telling the story as if the writer is the main character. This form is easily recognizable by the use of “I”, but it can be a very effective technique when writing. First person instantly gives your story a clear voice. The MC’s voice. The pace of your novel is faster, because the reader isn’t bogged down with lots of descriptions or various characters’ opinions; these are usually quick-reads. First person limits the amount of story that can be told, everything is filtered through the main character and we only see the events through their eyes. If you’re not careful it can become a grocery list and not a story. I did this, then I did that, and then I went over here. That isn’t a story; it’s a list of actions. 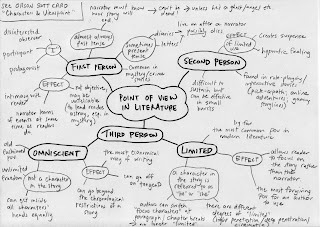 Second Person Point of View is telling the story directly to the reader, connecting with them as if you were in the room with them. This is not usually used in novels, but is often a gimmick, a technique of breaking the fourth wall. It allows the writer to connect directly with the reader. This can often be effective in short spurts, like a narrator who talks to the reader while the characters are separate from them. Often the writer ends up telling a story as opposed to showing the reader what is happening in the story. These stories can sometimes come off as ‘preachy’. Third Person Point of View can be further divided into Limited, Multiple Viewpoints, and Omniscient. All three are defined by the use of he/she. Third Person Limited is told from only the main character’s point of view, as if the narrator sat up their shoulder through the whole novel. 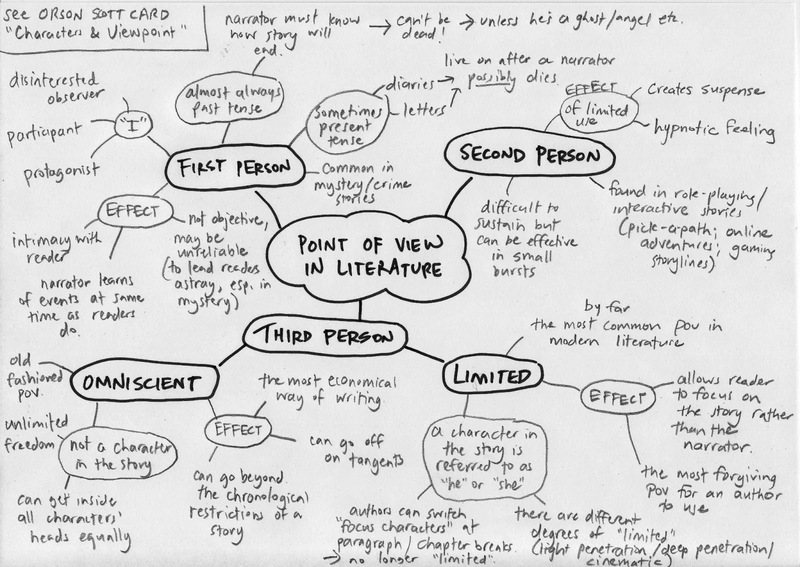 Everything the reader absorbs is from this single point of view, allowing the reader to get to know that character. Third Person Multiple Viewpoints is told from two or more points of view. This usually works best when one chapter is dedicated to a characters point of the view and different chapters represent different characters. Third Person Omniscient involves a narrator who lets the reader in on every characters mind and action. If third person limited has the narrator sitting on the main character’s shoulder, then third person omniscient is floating high above and telepathically linked to everyone. It’s a delicate balance to write, and I suggest reading some classical novels for inspiration. Many books are written in third person, it used to be the most common POV. Third person allows the writer to include greater depth for each of the characters not just the MC. It can distant the reader from the characters, whereas first person makes them feel like part of the story. What Point of View is your favorite to write, or do you have a Good or Bad point to share? Let me know in the comments. Let's Talk about Tweets... and Give One Away! Let’s talk about Tweets… and Give One Away! I wanted to take a quick moment to talk about Twitter. This isn’t an article about what Social Media is, whether it’s good or bad, or how it’s changing the world… just three ideas you need to ‘follow’ to get the most from Twitter. Yes, you can endlessly schedule promotions for your book and follow everyone you can find around the world, but that’s not really using twitter, that’s standing on top of the mountain and screaming the title of your book. People will hear, but there are other ways. Follow what you love! Follow your favorite authors, the sexiest stars, people you admire, or causes you believe in. Twitter is one of the best ways of keeping up with the things you care about – but you already knew this. Follow the industry! Follow literary agents, publishing conglomerates, small presses, magazines, reviewers, and editors, follow the writers, the literary organizations, and more. Twitter might just be the best way of following the publishing industry; it’s definitely the fastest – a lot less blogs to read. Follow the Hash Tags! Twitter is filled with conversations – writing tips, editing tips, review requests, contests calls, every genre has one, and more pop up every day! Some are well known like #amwriting, #writer, #author, #books, #poetry, and #contests. Others are less known like, #pubtip, #writetip, #yalit, #mglit, and #Fridayreads. Then there are the Twitter specific hash tags like, #FF (follow Fridays), #MM (Monday Mentions), #WW (Wednesday Writers), and #stl (for St. Louis). St. Louis Writers Guild even has one, #slwg. Join in, the whole world is having a conversation, and the best part is we are all invited. Did you know that The Writers’ Lens is on Twitter? We are, follow us @writerslens. You can also find us on Facebook, so stop by and like us, we’d appreciate it. Let me know your favorite hash tag in the comments section! And… because this is Monday, and we hold our giveaways on Monday, The Writers Lens is offering a promotional tweet, several of them actually. This is a call to authors and writers – sorry corporate America, but if you want The Writers Lens to tweet your information that would be sponsorship, and we can talk about that… but this is a call to all the authors and writers. You can enter the contest by leaving a comment on this post. Just tell us your @twittername or email, and the title of your novel or blog. The winner will be chosen on Sunday, January 20, 2013 and the tweets will run every day until Sunday, January 26, 2013! We’ll even give it cool hash tags so more people than our followers will see it. Note: we will only tweet your name, and the title of your novel, or blog address, this is not an endorsement of your novel or blog. We just want to help spread the word about you! Good luck and may your tweets go viral! Our Favorite Writers' Lens Articles of 2012! Our Favorite Writers’ Lens Articles of 2012! 2012 was an amazing year here at The Writers Lens, you’ve already seen the most viewed articles, and the biggest story we ran, but I wanted to bring you one more – our favorite articles from last year. T.W. Fendley, David Lucas, and I have written a variety of great stories and I went to both of them and asked for their favorite articles from the last year. Here are the three we chose. Also, St. Louis Writers Guild’s March Workshop for Writers “Sit Down and Pitch” will discuss how to pitch to an agent or publisher, and will feature practice pitch sessions too! It will take place on Saturday, March 2, 2013. Details will be posted on www.stlwritersguild.net in the coming weeks. Thank you for making The Writers’ Lens a true success, but we’re not slowing down. We’ll still be focusing our lens on great articles about writing, the publishing industry, great books and authors, more from 6 North Café, wonderful giveaways, and a few marquee articles just to blow your mind. May 2013 inspire you to write something amazing! Claire is the author of The Wrong Side of Memphis, Moonlight Becomes You So (2009), Crazy For You (2010), St. Louis Hustle, Candy Cadillac (2011) and fourth in the series, Tennessee Plates. She is a novelist, columnist, speaker and instructor at local universities. 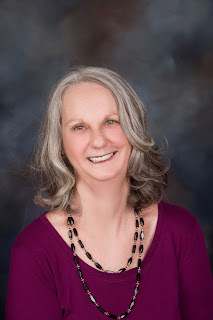 A graduate of St. Louis University and a participant in the Writers’ Institute at Washington University, she is a member of the St. Louis Writers’ Guild, the Missouri Writer’s Guild, the St. Louis Metropolitan Press Club, Mystery Writers of America, Sisters in Crime and the Ozark Writers’ Guild. For more information about Claire, visit her website: claireapplewhite.com. TENNESSEE PLATES: In ’68, the hot smoke and cold eyes of ‘Nam stalked Elvin Suggs. Now, it’s a blonde in a red dress and a silver Caddy—and, he doesn’t want to run. Autographed books will be available for sale on Jan. 12. Good Evening. Welcome back to the darkest corner of the Writers’ Lens as we continue the discussion on looking at Alfred Hitchcock’s techniques and how we can employ them to our writing. Have you heard a woman say they went to a movie, a play, or read a book and had a good cry? You never hear someone say they had a bad cry. They wanted a good cry. Have you ever noticed that when people go to horror or suspense movies, plays, or read a book that there will be points where they will jump out of their seats, maybe scream, and then . . .soon it is followed by a laugh? The importance of these reactions is on the quality of the cry, the scream, the surprise and the laugh. It a good reaction comes from hard writing and good manipulation of the audience by the writer, director, and actors. So how do we get there? The reason was not so much as Hitchcock wanted to be bossy (ok, yes he wanted to be bossy), but rather Hitchcock was manipulating character sympathy in the viewer. Character sympathy is the third emotional state of writing. (See Writing Hitchcockian—the Three Emotional States of Writing posted October 17, 2012) This is done in every good book you read, play you see, or movie you view. Often the author of the work had his or her own “method actor” to deal with as they wrote—some character which didn’t want to express what needed to be expressed. I think, but cannot prove, that this is why so many times we run across the writers telling us how the character feels. The telling can be as simple as: Jane was mad as she stormed out of the room. Or it could be done in dialog: “I’m so mad I could just spit,” Jane said. Would either of those scenarios really elicit your sympathy for the character’s emotional state? It wouldn’t mine. Where is the body language that implies how mad they are? A better question: Isn’t there someway to show how mad the character is instead of just telling the audience? The answer is yes. There are a lot of books written on body language and how to use it to read what a person is feeling or thinking. There are books on the subject aimed at the acting world to help actors improve their craft. There is also, now at least, a great resource for doing this for writers that I recommend. You can find this electronically. It is The Emotion Thesaurus: a Writer’s Guide to Character Expression by Angela Ackerman and Becca Puglisi. 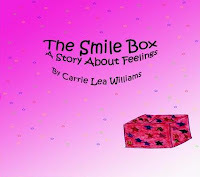 This book came from posts on their blog The Bookshelf Muse (http://thebookshelfmuse.blogspot.com/) which has many great entries exploring emotions, settings, physical attributes, character traits and more. Using the tool above, let’s relook at our mad character. Jane, turned on her heals, hiding her eyes that were moist from unreleased tears. Her face was flush as her fists called, digging her lacquered nails into the soft flesh of her palms. She walked toward the door, her back rigid, her chin high and her arms sweeping back and forth as if making her walk a military march. “I could just spit,” Jane said. Her legs were planted to the ground, as she flexed her fingers and turned her flinty gaze at the door. These are simple examples, but at no point do I say that she is angry. But, you can see it. The description should show the reader the level of emotion as well as the emotion and tell something about the character. We know she is not confrontational—or the situation will not let her be. We know in the first example that she refuses to let anyone see that she is on the verge of tears. We also can picture something about her hands, which tells the reader more about her. In the dialog example we can see her emotion from her eyes and that she is flexing her fingers. We can also see that her anger is making her defiant because she is standing planted to the ground. By using emotional description rather than just giving the emotion, the author can give the audience more depth to the character and create character sympathy for the character—even if that character is the antagonist. Thank you for reading and please visit www.davidalanlucas.com andwww.thewriterslens.com. You can also follow me on twitter @Owlkenpowriter and the Writer’s Lens @TheWritersLens. Fiction is the world where the philosopher is the most free in our society to explore the human condition as he chooses.